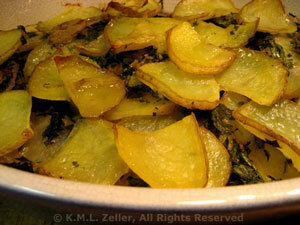 Potatoes Baked with Fresh Herbs and Garlic, simple side dish. This is something I watched "The Two Fat Ladies" do on their cooking show. Perfect for late summer, flavored with lots of fresh herbs and garlic; I hope I can do them as well as Jennifer. You can modify the herbs to suit your taste, just use lots! This serves 4. With a sharp knife thinly slice the potatoes. Put slices in a large bowl of cool water and set aside.